My friends Catherine and Mike, who bought my Lake Bled painting, recently bought a new house. It’s their first single-family home, a necessity now that their son Connor has joined the family. Catherine came to me and said Mike is excited and just loves the house. She wants to give him another special present and asked me if I could paint their house on an ornament. 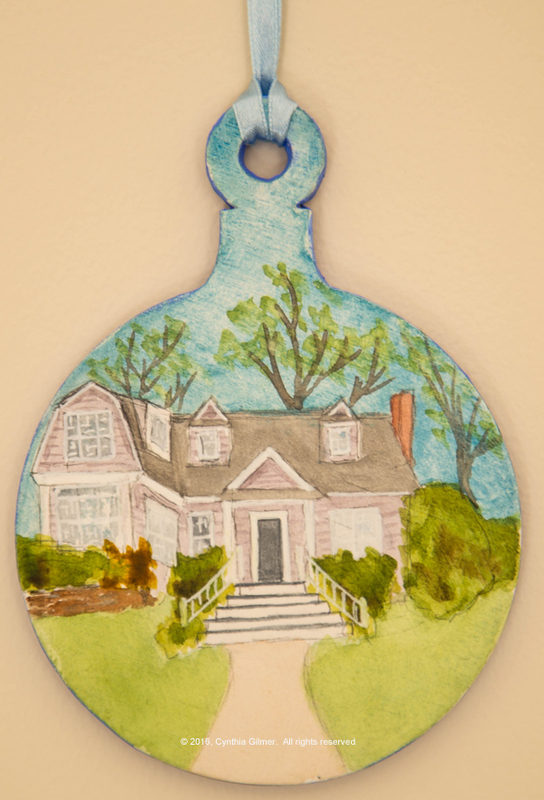 My first suggestion was that I paint their house and we have it transferred to an ornament, but she really wanted a hand painted ornament. I told her I would give it a shot. Catherine provided me with several pictures of her house and I began to explore options. I found out you can buy wooden ornaments in various different sizes and shapes on Etsy, so I ordered some round ones that are four inches in diameter. I decided that was as big as I dare go to have it be manageable as an ornament on a tree, but as small as I was willing to attempt to paint. My original thought was to do the painting in acrylic. I traced the ornament onto a piece of paper and did my first study of the house. I really didn’t like it. The acrylic paints were pretty unforgiving on the small scale. The result was messy. I decided to try watercolor. This presented me with a new set of challenges. With acrylic, which is opaque, I could just paint on the wood. If I was going to use watercolor I’d need to prime it with something. I got on line and found a product called Daniel Smith Watercolor Ground, which claimed to work on all surfaces, including wood. I bought some and primed the wood so it had a nice white surface. Here is the result (which looks better in person than in the photo). I hope it holds up and provides Catherine and Mike with a unique keepsake of their first real home together. This entry was posted in Paintings, Watercolor by OpusPlus. Bookmark the permalink.